First off, I have to tell you some exciting news that occurred over the weekend. Mi mama’s younger brother, Tio Tony, and his lady love became engaged and plan to get married sometime soon– Woohoo! Which means I’m going to have a brand new tia who can spoil me and love on me and scratch my belly and sneak me carrots and Greenies, as well as a totally new lap to sit on. Oh happy day! I still haven’t met her yet as she and Tio Tony have been out of the country for the past month and a half but I plan to mark my territory welcome her with open paws in May when they get back into town. Felicitaciones to the happy couple! In other exciting news, mi mama came home with a huge carton of fresh blackberries from Costco on Saturday! Okay so maybe it’s not as exciting as an engagement but it sure did make me happy. I love fresh berries and blackberries are one of my favorites to use in healthy recipes for mi familia. Considered a superfood by nutritionists and dietitians, blackberries are among the top ten antioxidant-containing foods. They are high in fiber as well as Vitamins A, C, E and K, all of which help prevent cancers and heart disease. All this wrapped up into a plump little purple berry that looks adorable and tastes muy delicioso. Oh and did I mention blackberries grow as wild and crazy here in the great state of Oregon during the summer months as the back hair grows on mi papa’s best friend’s Italian great-uncle Vincenzo. Pretty fantastico, if you ask me. I began thinking of all the wonderful ways in which I could use these little nutrient-packed powerhouses, and after throwing around ideas such as, in smoothies or cobblers, I finally settled on coffee cake. But not just any kind of coffee cake. 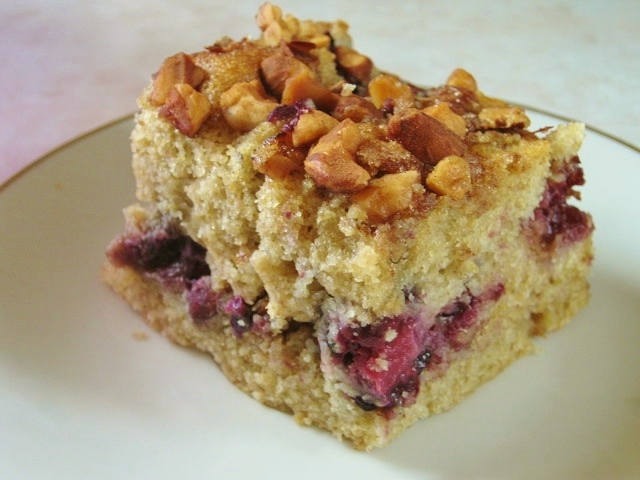 A blackberry-almond coffee cake. Yowza! Talk about tasty. And with the addition of almonds (also a superfood) this ended up being one healthy and antioxidant-rich little breakfast treat. 1) Pre-heat oven to 350 degrees. Grease an 8″ square cake pan with cooking spray. 2) Whisk together the flours, baking soda and salt in a medium size bowl. 3) In a large bowl, beat the brown sugar, butter and oil until well combined. Beat in the eggs and then the vanilla and yogurt until fully combined. 4) Add the flour mixture to the wet mixture and stir until just combined. 5) In a small bowl, stir together the granulated sugar, cinnamon and almonds. 6) Spread half the batter into the bottom of the prepared pan. Sprinkle half the almond mixture on top of the batter and top with the blackberries. Spoon the rest of the batter over the berries, smoothing the top. Sprinkle the remaining nut mixture over the cake. 7) Bake 30-35 minutes or until a toothpick comes out clean when inserted. Let cool slightly and then unmold to allow to cool completely on a cooling rack (or just leave it in the pan, if you wish). So there you have it. Two exciting items I just shared with you today. An engagement and a coffee cake. Talk about a great start to the week, if I do say so myself… and I do. 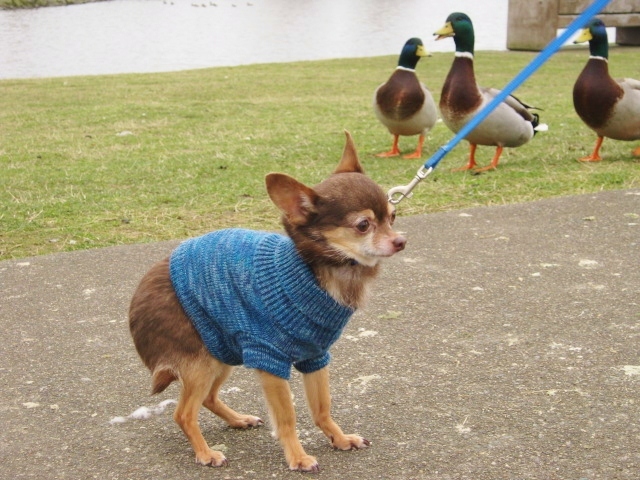 Now if you’ll excuse me, I’ve got a meeting with a couple of the local ducks down the street about the upcoming neighborhood picnic. They’re requesting I bring loaves of bread… shocking. Congratulations on your new tia, Teeny!! Congrats on the new addition to your family! I have no doubt that the engagement was accepted based solely on the fact that you were part of the package deal. Who could say no?